Granary Gallery owner Chris Morse with Going West. 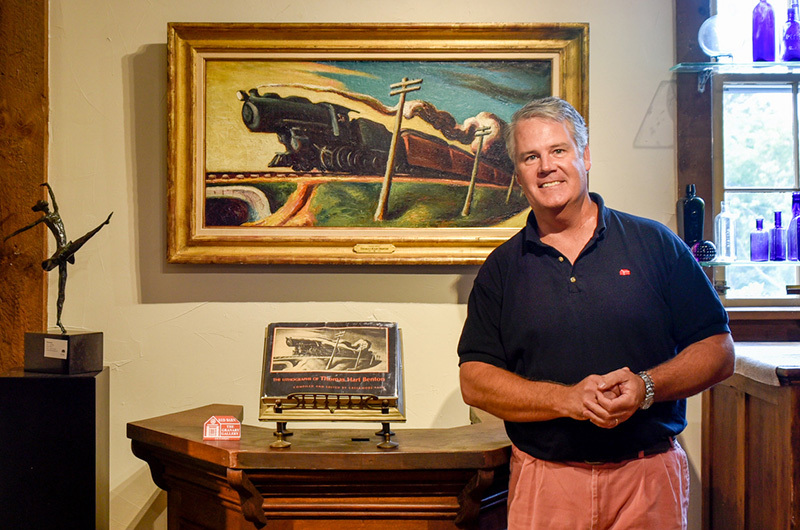 Before arriving on Martha’s Vineyard recently, Thomas Hart Benton’s 1926 train painting Going West had only been exhibited in public twice in more than 90 years: in a 1927 gallery show and, a half-century-plus later, at a Christie’s auction in New York, where it was purchased for a Connecticut couple who owned it for close to 35 years. The Granary Gallery in West Tisbury recently acquired the oil on canvas, called “one of Benton’s greatest achievements as well as one of the greatest achievements of 20th century American art” by art historian Henry Adams of Case Western Reserve University. “Few paintings in the history of American art are so American. If you hung it beside Hopper’s Nighthawks it would hold its own. It would be hard to tell which is the greater picture,” Mr. Adams wrote in an essay about the painting for the gallery. “Henry Adams is literally the man that wrote the book, or books, on Thomas Hart Benton, and he is considered the absolute expert in many aspects of American art, so having his words sing the praises of this painting is fantastic,” said Granary Gallery owner Chris Morse. In Benton’s painting, the black locomotive of an express train lunges forward, a panther in pursuit of unseen prey. The engineer, a tiny but tense figure in the window of the cab, crouches forward like a jockey urging his mount to greater speeds. Everything about Going West signals velocity: the smoke whirling back from the stack; the telegraph poles by the side of the track appearing to reel in astonishment as the train rockets past them; the overpass, coming up just ahead to lead the locomotive out of frame; even the brushwork, a lusty impasto that testifies to Benton’s lifelong passion for trains. “I never hear a train whistle without profound impulsions to change, without wanting to pack up my things, to tell all my acquaintances to be damned, to be done with them, and go somewhere,” he wrote. Mr. Morse declined to say exactly how the gallery acquired the painting, which spent decades in the collection of comedian Bill Cosby and his wife. “We were aware that it was going to be available and we pursued it,” he said. Similarly, Mr. Morse preferred not to say what the gallery expects to earn from the painting once it finds a buyer. In the meantime, Going West hangs prominently in the Granary’s main gallery, where art lovers and Benton fans have already been making their way to view the rarely-seen work. “Like Roasting Ears,” a significant Benton on a rural theme that the Granary showed last year, “it is a painting that people visit,” Mr. Morse said. Those who wish to see it should make the pilgrimage soon. Like Roasting Ears, Going West will likely find a buyer soon and after that, it could be another lifetime before it comes before the public again. “It is as blue-chip a piece of American art as I’ve ever had the pleasure of being involved with,” Mr. Morse said.